Sudden cardiac arrest claims the lives of thousands of people every year. In the United States alone over 300,000 people require First Aid assistance and CPR because they are suffering a cardiac arrest. Unfortunately, most people experiencing a cardiac arrest do not receive the emergency aid required to save their life. With the survivor rate hovering around 9.5% when it comes to out-of-hospital cardiac arrests, it is time we encourage people who have not already done so to get certified in both First Aid and CPR. There are several excellent reasons for getting certified in First Aid and CPR. Today, we will take a look at some of those reasons and discuss how someone living in the Baltimore area can get the proper training that could someday save a life. When someone is afflicted with a cardiac arrest, they may suddenly collapse, lose consciousness, and even stop breathing. This is because during a cardiac arrest, the heart is no longer properly circulating blood and oxygen throughout the body. The longer the body goes without proper circulation, the lower the chance the affected person has of surviving. It has been discovered that the chances of someone surviving a cardiac arrest significantly increases, by more than double, when CPR is started early. This is one major reason why you should become certified in performing CPR. You never know when you might be in a situation that requires your training and since performing CPR boosts the chances a person will live, there is no harm in knowing the proper procedures. In addition to cardiac arrest, CPR may be required if someone drowns, chokes, or even becomes electrocuted. Each of these instances has the potential to cause a person’s heart to beat irregularly and prevent circulation. If you are certified in both First Aid assistance and CPR, you will be able to recognize the signs of someone in trouble right away and be able to administer the proper care until medical personnel can arrive. If you receive your First Aid and CPR certification from Baltimore’s leading instructors, you will be able to notice signs of an emergency, apply the knowledge shared with you during the certification courses, and remain calm in an otherwise panicky situation until the proper authorities show up to take over. This preparedness is priceless and can literally prevent someone from losing their life. National statistics have shown that only 15-30% of people who experience sudden cardiac arrests outside of a hospital setting receive any type of First Aid or CPR. This is devastating since the application of such skills and techniques can make a substantial difference in someone’s recovery. They never received training. While this may be true initially, there is no reason why someone cannot pursue training later in life. There are many cost effective courses that have flexible schedules so that everyone interested in learning First Aid and CPR can. They fear they will harm the person. Though some harm may occur during the performance of CPR on a person experiencing a cardiac arrest or some other medical emergency, trust us, the harm of doing nothing is far worse. They fear legal ramifications. With Good Samaritan legislation in effect in all states, even if harm does come to the affected person, so long as you were not negligent or malicious in your actions, there will be no trouble for you. Even if you were not officially certified to be applying First Aid or CPR, there are no laws that will incriminate you for trying to save someone’s life. Concerns about infection. Though a legitimate concern, there are ways that you can administer First Aid and CPR to a person without cross contamination of germs. Further, during CPR, there is a way to keep a person alive without using mouth-to-mouth resuscitation until EMS personnel shows up. With proper training techniques, you will know how to do this and the fear of infection will lessen. Learning how to perform CPR and administer basic First Aid is not difficult. You will certainly find this to be true after taking your Baltimore First Aid and CPR certification courses. Even after becoming certified, there are plenty of online videos, tutorials, classes, and articles to help you keep in mind how to perform the life-saving techniques you were taught. These refreshers come in handy because as time goes by, the old saying “If you don’t use it, you lose it” may start to apply. While it would be great that you have not had to use your skills in a real life emergency, it is good to stay up-to-date on all of the skills and techniques, just in case. Some 70 percent of cardiac arrests that occur outside of a hospital actually occur inside the home. This leaves someone suffering a cardiac arrest very little time to survive unless someone inside the home, usually a family member, is trained in First Aid and CPR. Ideally, every household should have at least one person certified in First Aid and CPR, and the more people that are trained for emergencies, the better. In fact, regardless of cardiac arrest situations, think about all of the accidents and emergencies that can happen when in the home, especially if there are children in the home. Drownings, broken bones, cuts, sprains, falls, and choking are just some of the terrible things that can happen to anyone at any time. Being certified in both First Aid and CPR can dramatically reduce the recovery time after such emergencies and really help someone in need. Another great reason to become First Aid and CPR certified is because your Baltimore employer requires it. And, since OSHA claims that over 10,000 people suffer from a cardiac arrest on the job each year, it is not a bad idea to be certified regardless of whether your employer requires it. Jobs such as teachers, lifeguards, firefighters, nannies, and more are all occupations that may require, or at least strongly suggest, First Aid and CPR certification. And, as Baltimore employers realize the benefits of having their employees certified in both basic First Aid and CPR, many are now requiring certification before the hiring process can be completed. As an employee certified in First Aid and CPR you will learn to recognize emergencies and when to call EMS personnel. You will know which First Aid techniques to perform and how to provide CPR if necessary. Once you have decide that you are ready to become certified in First Aid and CPR, you will probably have questions such as where and how to go about getting certified. Luckily for those in the Baltimore area, Maryland’s CPR and First Aid experts at Chesapeake AED Services provide thorough training and proper certification of both First Aid and CPR. By enrolling in one of our First Aid and CPR certification classes, you will leave understanding the basics behind First Aid and how to handle an emergency situation, even if it requires CPR. 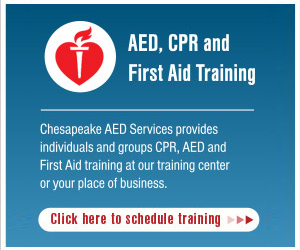 Chesapeake AED Services’ certification classes are affordable, provide lots of valuable instruction from industry experts, and are even offered online for those strapped for time. 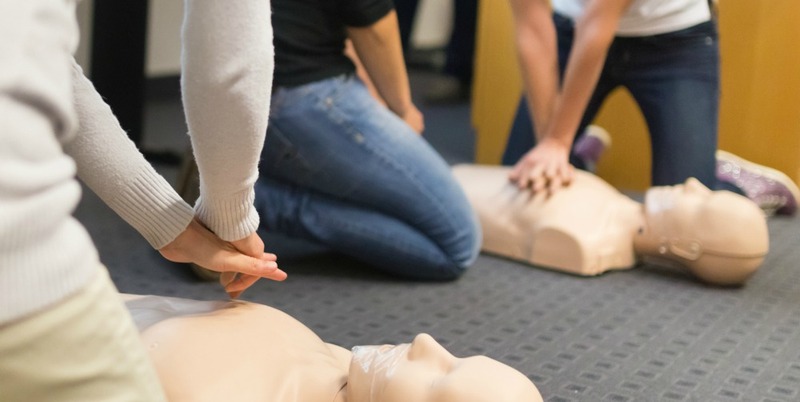 If you are interested in being equipped with lifesaving skills that come with being First Aid and CPR certified, register for one of our classes today. Be prepared for anything and become a lifesaver in waiting! Heart Attack or Cardiac Arrest? Know the Difference!